MESHELL NDEGEOCELLO is more than an American singer-songwriter, vocalist, bassist, and rapper. She’s crediting with helping to spark the neo-soul movement. Starting her career in the late 1980′s, Ndegeocello honed her skills with bands such as Prophecy, Little Bennie & the Masters, and Rare Essence. In 1993, she went solo, and was one of the first artists to sign to Maverick Records. She released her debut album on the label. “That’s Your Boyfriend (He Wasn’t Last Night)” was Meshell’s first self-penned Billboard 100 hit, which peaked at #73. She had a #1 dance hit with her cover of Bill Withers’ “Who Is He (and What Is He To You)?” which was featured in Jerry Maguire. 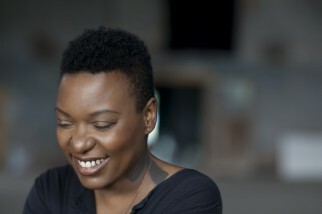 Ndegeocello has collaborated with numerous artists ranging from Herbie Hancock to John Mellencamp, Madonna, Indigo Girls, Blind Boys of Alabama, and more. Her most recent release is titled Weather, and according to Meshell, the record is more peaceful than her previous releases. The album was produced by Joe Henry, who Meshell credits with helping to reveal a different side to herself. The album covers the ups and downs of love, a dedication to Janis Joplin, and contains her always concise, poetic, and image rich lyrics.